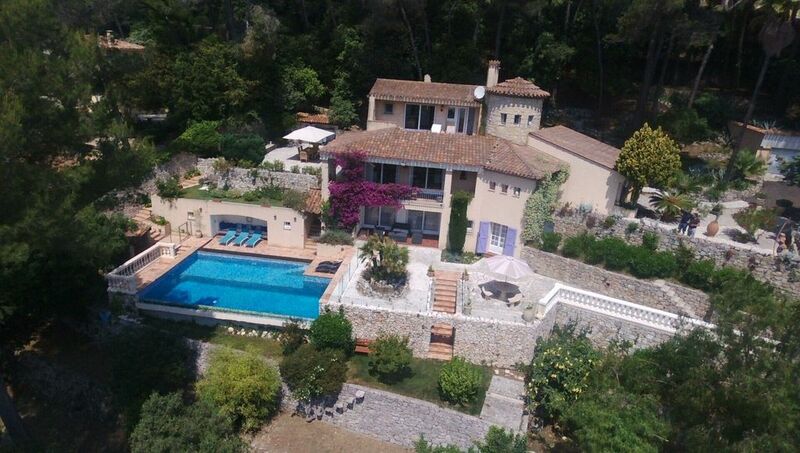 This luxurious villa (420 M2) on c. two acres at the edge of woodland with mature gardens is just ten minutes from Cannes. Although less than three kilometres from the beaches, the villa offers a high degree of privacy unusual for the area. The villa enjoys panoramic views encompassing the sea and Cap d'Antibes. The western terrace overlooking the pool accommodates 12 or more diners with barbecue.The extensive grounds are beautifully maintained by the gardener who resides at the gate lodge. The villa is only a short distance from a great number of amenities including the sea, beaches, golf, horse riding, marinas, etc., and is only twenty minutes from Nice Airport. There are numerous hideaway places throughout the villa's extensive and beautifully matured grounds. Also the villa has no less than four separate BBQ areas each with its own unique views. The main bedroom (double) with private sun terrace has two en suite bathrooms, one with a bath and WC the other en suite with a separate shower room and WC.This bedroom is air-conditioned. Two more double bedrooms A/C have en suite full bathrooms with WC. Another bedroom contains two double beds and has en suite bathroom while a twin bedroom share one full bathroom and WC. A further bedroom is in use as a children's bedroom suitable for four (can be changed ).There is also a large children's playroom on the ground floor. The villa is ten minutes from the Cannes Country Club championship golf course. Riding and tennis clubs nearby. Boat chartering at Golfe Juan. The villa is five minutes from two entrances to the AutoRoute, twenty minutes from Nice International airport, within walking distance of Vallauris and the Picasso Museum. Excellent dining and shopping and cultural venues. The gate lodge(well away from villa) is occupied by the gardener who maintains the extensive ground. For example within 10 minutes drive from the villa one can shop on the beautiful Rue d'Antibes Cannes, have lunch at the port in Antibes, sunbathe back at the villa in the afternoon and have dinner at one of the many excellent restaurants in Mougins .Monte Carlo ,Nice,Cap Ferrat, St.Paul de Vance , St. Raphael and St. Tropez are all only short drives away by car. The villa has two terrace areas, two BBQ areas, pool shower and changing area and a double garage. Children facilities include a tree house, slide and swing, and a large playroom inside the villa.